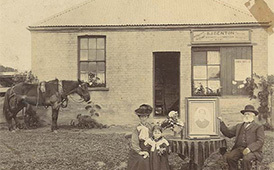 If you live on the Mornington Peninsula you will have no doubt heard of the Benton name with roads and shopping centres named after the pioneering family. But you may not know the story behind a rich history of five generations that is still very much alive and well and still doing business on the peninsula. Stuart Benton is one such family member – the fifth generation Benton who lives on the original family farm and has, unintentionally, followed in his great great grandfather, Benjamin’s career footsteps. Like his ancestor, Stuart is a farmer, licensed real estate agent and insurance broker. Stuart’s great great grandfather, Benjamin James Benton immigrated to Australia with his wife and five children in 1852, and is most notably recognised by the naming of Bentons Road in Mornington in honour of his service to the fledgling Mornington community. Benjamin worked as a real estate agent, agent for insurance and farmer, leaving behind his legacy to his family and community. “While I was working at Elders in Mornington as an estate agent, the idea was presented to me to venture into the insurance industry. VACC Insurance were looking for someone to help grow their rural book of insurance and my history in rural property sales and farming turned out to be the perfect fit.”. “After my eight year stint working in the corporate insurance sector, I started Benton Insurance Services in 2002” said Stuart. While Stuart says that 40 per cent of the business is in the farm and rural sector, Benton Insurance Services is at the forefront of tailor-made insurance products businesses, farm, aviation, trades, marine hull and even home, contents and motor vehicle insurance, Australia wide. “With the business expanding again with additional very talented staff, we moved our office to Hastings.” said Stuart, whose business has grown from two to six in a relatively short time. “As experts in general insurance, we are able to go to the Australian insurance marketplace and selectively look at the offerings of hundreds of insurance providers and pick the best products for our client’s at the most economical price available. “We are a privately owned, family business and our experienced insurance advisors work closely with our clients and utilise their insurance knowledge to help source and prepare a tailored insurance solution that works for the client. We work on behalf of our customers, not the insurance company.” said Stuart. 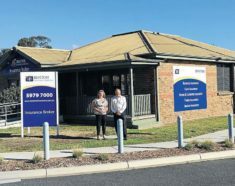 “Benton Insurance Services is the only brokerage on the Westernport Bay side of the Peninsula with our closest competition being Mt Eliza and Rosebud”. Stuart said. In the tradition of his forefathers, Stuart puts a whole new meaning to insurance broking. The fifth generation farmer could not be more down to earth, spending time on his business and then throwing on gumboots to tend to the family 100 acre property in Tyabb where he and his wife run cattle and sheep. Stuart recalls one day while working in his Tyabb office, receiving a phone call from a neighbour that their 1 tonne bull, Nelson, was seen walking down the road. “I immediately jumped in the car and got back to the farm to sort out my bulls’ newly found wandering habits. He had indeed been walking up Boes Road but luckily enough was easily coaxed into my neighbor’s farm with a bale of hay, all 1046 kilos of him,” said Stuart, explaining it’s all in a days work for this insurance broker and farmer.